UFO hunters are now turning to an Obama administration initiative in the hopes of revealing what the government really knows about extraterrestrials. 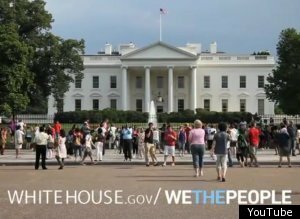 Under the White House's "We the People" program, citizens can appeal to officials "to take action on a range of important issues facing our country." "If a petition gets enough support," the government website promises, "White House staff will review it, ensure it's sent to the appropriate policy experts and issue an official response." Gentlemen, start your intergalactic engines . . .
By "enough support," the administration means a petition has to receive just 5,000 signatures within 30 days to warrant an official White House response. That's a low enough threshold to get a lot of conspiracy theorists licking their suspicious chops. Bassett is executive director of Paradigm Research Group which advocates for the truth about UFOs. "In 1996, when I launched the Paradigm Research Group, I registered as a lobbyist on behalf of a number of organizations on this particular subject -- the idea of total disclosure of an ET presence on Earth by the world governments," Bassett told The Huffington Post. "Everything PRG does, including World Disclosure Day -- all of it contributes to this process." And now the die is cast, because within just four days of Bassett's petition being registered, it amassed more than the necessary 5,000 signatures to warrant an official White House response. And that just delighted arch UFO skeptic Robert Sheaffer. "Well, now we've got something to look forward to!" he said sarcastically. "It would be one thing if what it were asking is, 'Please reveal all that you know about extraterrestrials.' But this wording pre-supposes that the contact is already going on," Sheaffer told HuffPost. "It doesn't allow the possibility that there isn't an extraterrestrial presence already engaging the human race." Sheaffer, author of the new book, "Psychic Vibrations," suggests President Obama made a mistake by offering to respond to any petition with a relatively modest number of signatures, "because there's no shortage of bizarre and marginal groups and beliefs that can raise 5,000 signatures." As Alejandro Rojas pointed out in his recent HuffPost blog, there are examples of prior American presidents -- such as Bill Clinton and Jimmy Carter -- who tried to obtain information about UFOs. Even John F. Kennedy asked his staff to provide him with UFO materials. So now, both alien believers and skeptics are playing a mutual waiting game as they anticipate someone at 1600 Pennsylvania Ave. in Washington to tell us who's right. "The response from the White House could be utterly trivial," said Bassett. "They could just blow it off by saying something like, 'Our policy is that we don't investigate this phenomenon anymore' -- which is a lie -- 'and whatever this phenomenon is, it doesn't pose a threat' -- which they don't know for sure." And a White House spokesman told HuffPost, "It's not going to be practical for us to start commenting on each individual petition ahead of their getting officlal responses." But when that official response about extraterrestrials on Earth comes -- as it must -- will you believe it?